This beautiful fruit salad is like a lighter form of fruit cocktail - just a tad creamy, but still allowing the exquisite taste of the fruit to come shining through. 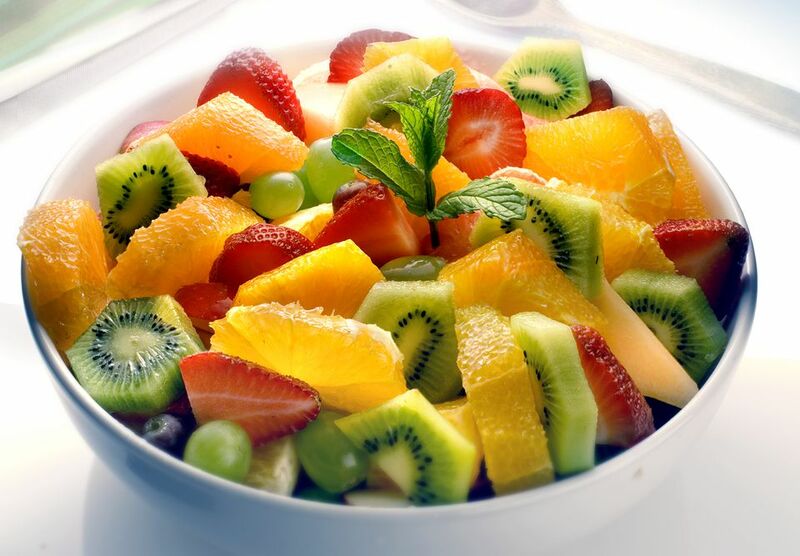 It's made with a mouth-watering assortment of tropical and local fruit for the most divine fruit salad ever. Great for everyday eating as well as serving company (see my party tips!). And it's really easy to make - just get your fruit together, ask a friend or family to help you slice up the fruit, and you'll be enjoying this tropical wonder in no time. Healthy, beautiful, and oh so scrumptious, this exotic fruit salad will have you forgetting about any other dessert - and you'll still crave it again tomorrow! Slice up all the fruit - except the contrasting red fruit (raspberries, strawberries, or dried cranberries) - and place in a mixing bowl. Drizzle over the lime juice and gently stir to combine. Then sprinkle over the sugar, stirring to combine. Set in the refrigerator for at least 30 minutes, or until you plan on serving your salad. Before serving, pour over the coconut milk and stir once again. Taste-test the salad for sweetness, adding more sugar if desired. If too sweet for your taste, squeeze over some more lime juice. Portion up into bowls and top with some of the red contrasting fruit - raspberries, strawberries or dried cranberries (the latter are very nice for Christmas). ENJOY! This salad is beautiful for a party served in martini glasses (as shown). It's also easy and delicious made ahead of time, as the fruit needs time to absorb the sugar and lime juice, making it taste even better (you can make it up to 8 hours in advance, then place covered in the refrigerator). Just hold off adding the coconut milk until guests arrive, then pour it over and give another gentle stir and taste-test. Also delicious topped with a dollop of whipped cream or vanilla ice cream, or a drizzle of Grand Marnier, coconut rum, or other liqueur of your choice. Cheers! How to Use Leftover Coconut Milk: 9 Great Recipes!